Being voted the Second Coolest Headquarters in the world by the Wall Street Journal is pretty impressive. Even if it is only second best. Our design for the Metrick System offices was only bested by Red Bull head offices, which, considering the calibre of the companies is definitely cool. Making something that stands out requires some creative thinking, but more importantly it requires a client that also has the mojo to go down that path with us. Our adage “we don’t know what the outcome will be, but we know it will be cool” applies here. Our client had given us a scrap book of images and ideas as a starting point for our design work. In this scrap book was a photo of an actor’s trailer. It wasn’t anything special, just a trailer that you would see parked at any film shoot on any street in any city. We interviewed the client to get an idea of what they were all about. Their main business was creative advertising both print and media. They worked as teams, so an open office was appropriate and they needed a space to have audio recording as well as video recording for their clients, so a place that was sound proof. They wanted the office to reflect their quirky approach to advertising. This was not a main stream ad agency and they didn’t want to look corporate. The shell of the building they were located in lent itself to the open office concept with the high ceilings and big glass windows. What worked against us was the fact that it was a second floor and that all electrical work had to be surface mounted (meaning nothing could go inside walls or floors). 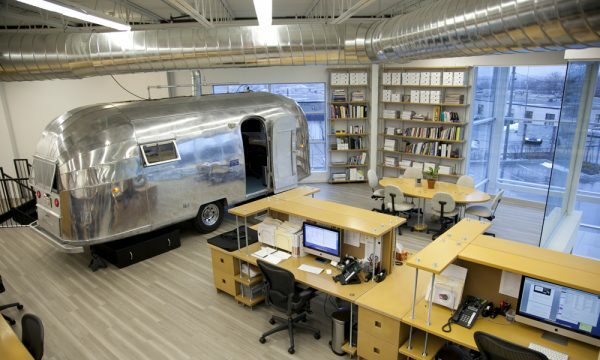 When we approached the client with the original concept of using air stream trailers make the private spaces for the recording studios, kitchen and president’s offices, we had already done some research to see what we could buy for trailers. We found trailers available across North America that had been abandoned or left aside in original condition. The client did all the purchasing, and these trailers eventually made their way to the parking lot where the contractor spent the next few months stripping the pink paint off one, cleaning the 20 years of animal yuck out of another and stripping the old wiring and shag carpet out of the third. 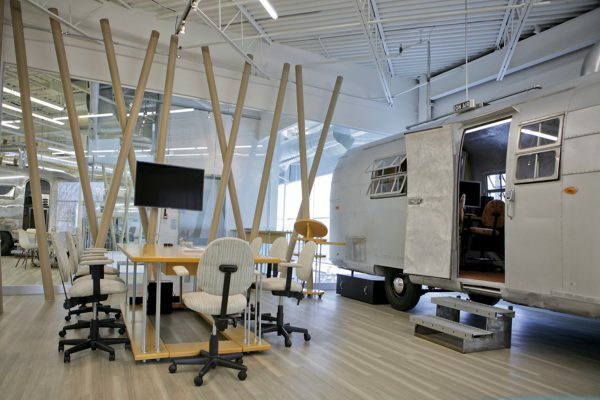 The end result is an office that uses off beat materials; card board tubes to hide wiring and cables to the desks, MDF work stations, an 50’s golf cart reminiscent of Hollywood back lots as well as the iconic air stream trailers. Our design image was so strong that the air stream trailer was eventually worked into the company’s new logo. 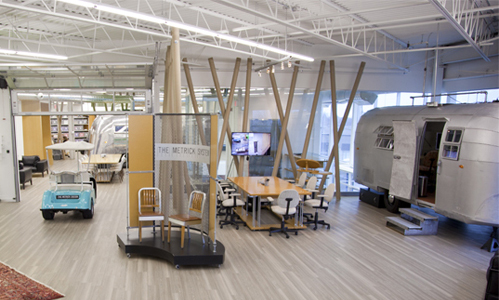 Our client remarked that the impact of the office space was so strong that when their clients walked in to their offices, the first reaction was generally “wow, this is great”. Not only was our design successful in being voted the second coolest headquarters in the world, but it was also honoured with an Award of Merit from ARIDO.